← The First Longbox Graveyard Podcast Is Here! Avengers: Infinity War has conquered the box office, and it is safe to say that if you have been following Marvel’s movies for the last decade or so, then it all added up to this! Like many of the geeks reading this blog I fairly came out of my seat when I saw Thanos in the original Avengers end credits. He’s one of my favorite Marvel bad guys (celebrated in a recent Panel Gallery) and the backbone of fondly-remembered Captain Marvel and Warlock runs that were among the first books I reviewed here at Longbox Graveyard. For the last several years, Thanos has been teased in a host of Marvel movies, and with Infinity War we finally got Thanos himself front-and-center, taking on the Avengers and seemingly every other hero in the Marvel Universe. Now, Thanos is a tough dude, but even he couldn’t take on those kinds of numbers by himself. 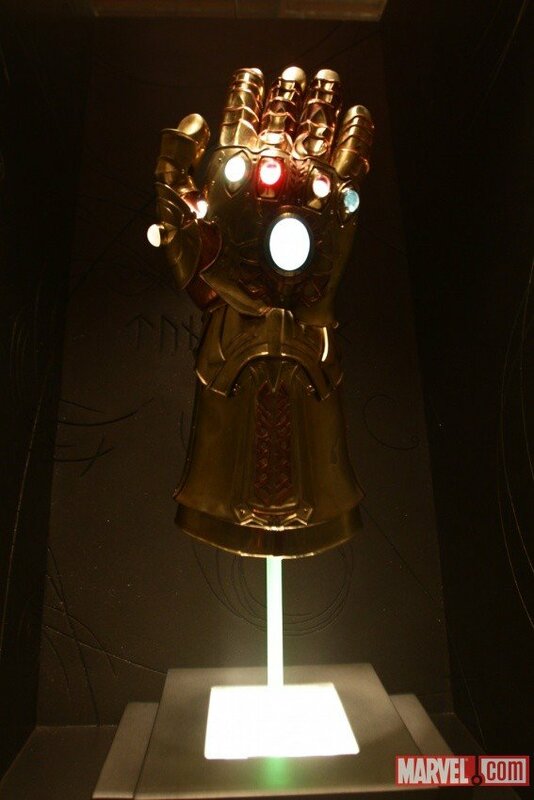 Fortunately for those of us who love bad guys, Thanos isn’t alone … he had the Infinity Gauntlet. The odds are actually on Thanos’ side! I recommend the terrific “Thanos For Beginners” primer that Mars Will Send No More put together if you want to know everything about this classic Avengers villain, but for now it’s enough to note that Thanos is a Death God from Titan, and a superpowered alien obsessed with Death personified in female form, whom he courts as a lover. 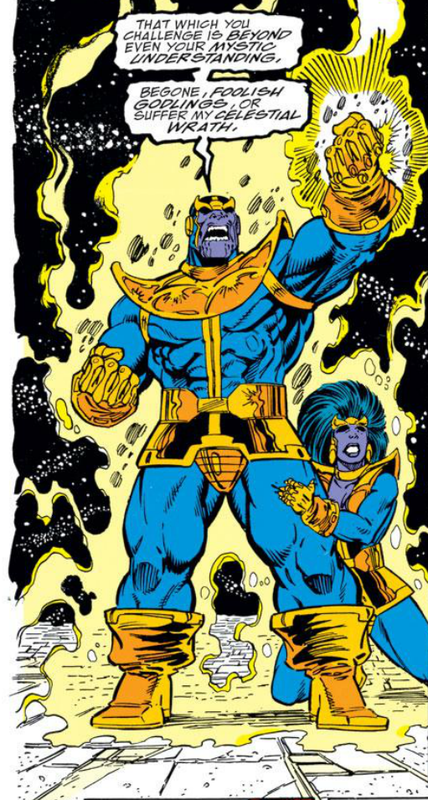 Unfortunately for Thanos (and everyone else), Death doesn’t much care for Thanos, driving the Titan to greater and still greater acts of murder as he tries to win her favor. 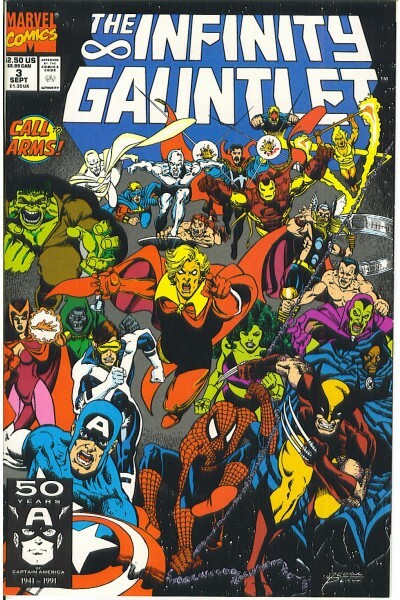 With that kind of power in Thanos’ grasp, the only solution was to create a big, sprawling mini-series, authored by Jim Starlin, and illustrated (for awhile, at least), by George Perez, who made a career out of drawing these every-superhero-in-the-universe team-up books. 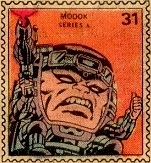 The six issue series used the entire universe as the setting for the ultimate battle between good and evil. 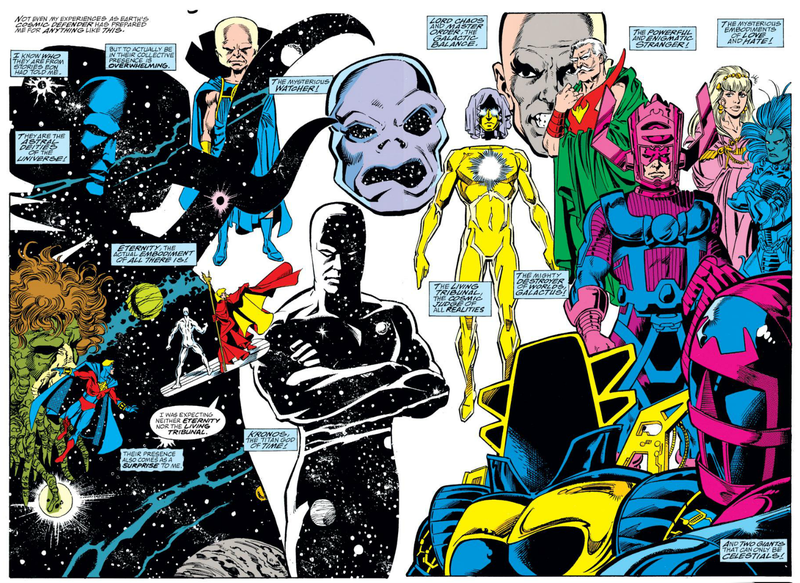 It’s not just the Marvel heroes that got into the act — Starlin put out a casting call for every cosmic god in the Marvel Universe, too. Odin and the Sky Fathers were stuck in Asgard, thanks to a shattered Rainbow Bridge, but more space gods than you could shake a stick at respond to the call, including Galactus, Eternity, a couple Celestials, and less well-known gods like the Living Tribunal. It’s this very scope of the book that most undermined the drama. When half the Marvel Universe is wiped out in your first issue, it’s not a matter of “if” — but “when” and “how” — the carnage will be undone. It is a testament to how much we love these characters that their “deaths” still pack n emotional punch (and this applies to the movie, as well). It is fun, in a disaster-movie sort of way, to watch California slide into the ocean and see Manhattan in ruins — but because we know it must all be set right somehow, it’s hard to take the story seriously. What we really had here was an apocalyptic wrapper for a bigass superhero beat down, and in this Infinity Gauntlet delivered. 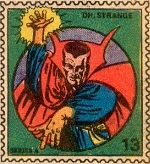 The defense of creation was led by Adam Warlock, who rounded up the requisite Avengers and other Marvel heroes to keep Thanos distracted by beating on his head. 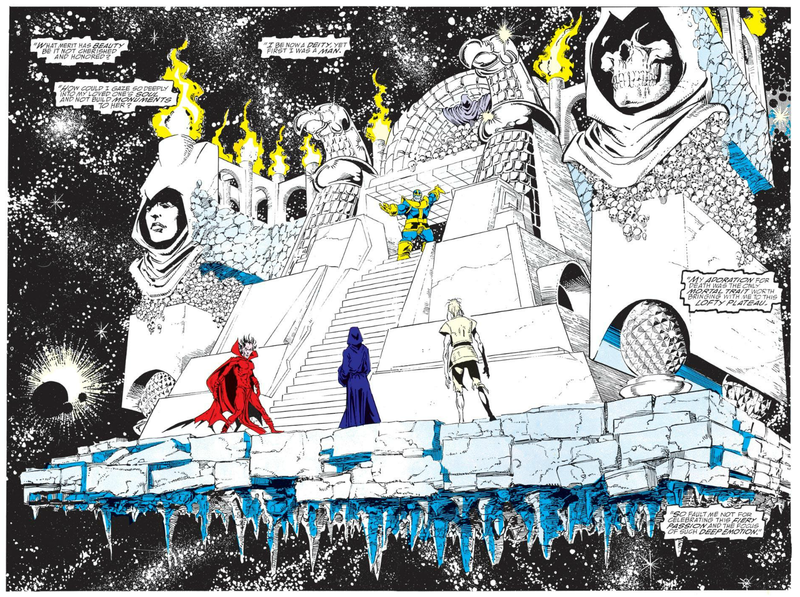 Warlock maneuvered to checkmate his old foe by playing on Thanos’ weaknesses, such as the hubris that leads the Titan to create a pretty damn groovy outer space floating palace of death. But even after awarding her with the next cover feature of Tomb & Garden Magazine, Death still wouldn’t give Thanos the time of day. Finally getting wise to Death’s ways, Thanos threw her under the bus for a woman of his own creation — Terraxia The Terrible — who looked like Oprah Winfrey cosplaying Thanos. Infinity Gauntlet might span all of time and space, but when the chips were down, it was still about comic book characters throwing haymakers at each other. And that’s fine with me. It’s genre-appropriate — and even kind of comforting — to debate the nature of good and evil with a smack in the mouth. It’s not all fist city. Even with such a vast cast of characters beating each other up, Starlin found time for some nice spotlight scenes, such as a little Hulk/Wolverine bromance over being the toughest guys in the room. So Infinity Gauntlet really was quite a traditional comic book event, with a universe-devouring threat, and a bunch of heroes solving things with their fists. 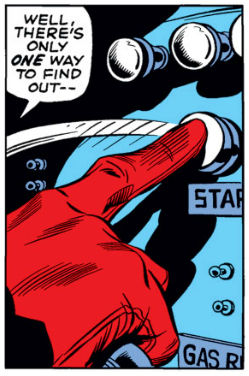 Kind of like Secret Wars, without all the angst and cross-overs. It did get a little silly at times, but all is redeemed by a solid ending, which sees Thanos defeated in clever fashion (“spolier,” I guess), and the ol’ re-set button punched in a way that I didn’t see coming. 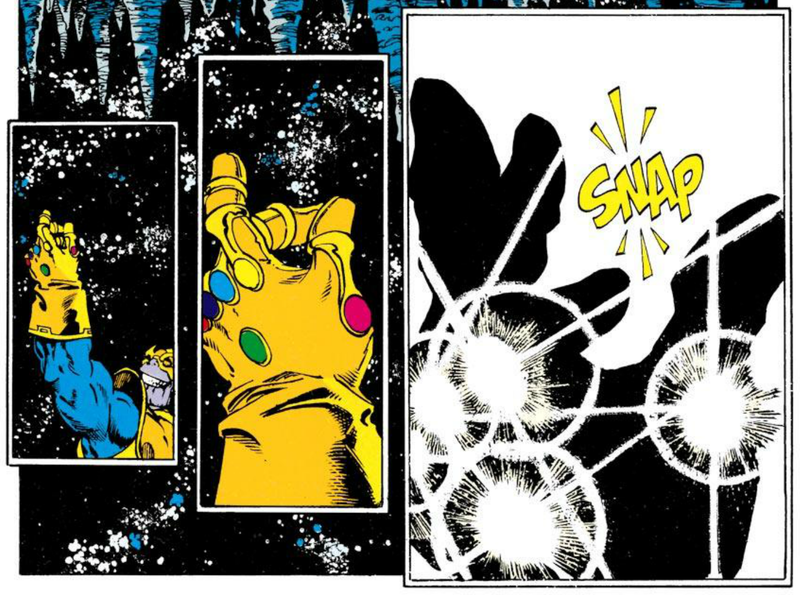 I would have preferred that Jim Starlin both draw and write the book (or that George Perez had done the whole series, rather than yield to Ron Lim half way through), but for the most part I’m satisfied with Infinity Gauntlet, for its high stakes action and an overload of Thanos triumphant! In the meantime, I’ll head back to the theater and enjoy Thanos’ star turn one more time! Enjoy the show! NEXT: #54 Top Ten Manliest Superheroes! Posted on June 20, 2012, in Reviews and tagged Avengers, Cosmic, Cosmic Cube, George Perez, Infinity Gauntlet, Infinity Gems, Jim Starlin, Marvel Comics, Marvel Studios, Thanos, Warlock. Bookmark the permalink. 26 Comments. Thanks you, Dizzy, both for the sentiments and an opportunity to plug the podcast, which interested listeners can find here. It’s only about a half hour long — give it a listen and let me know what you think! Great post Paul. On my return to comics after about a 20-year break, I bought a hard cover called “The Thanos Imperative.” I very much enjoyed it. Complex. Pretty art. Lots of melodramatic, large scale cosmic action. 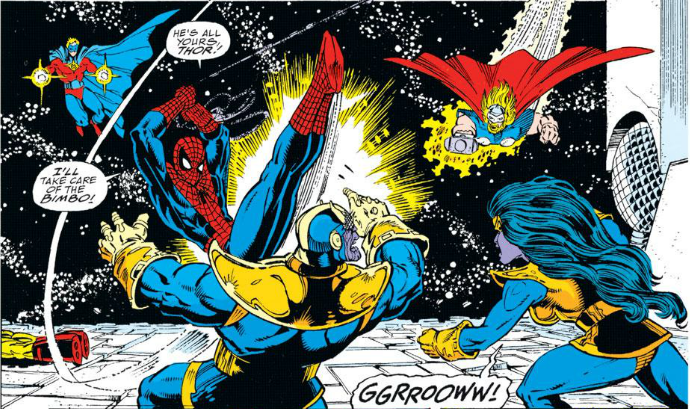 It caps off the modern Guardians of the Galaxy pretty nicely and is simultaneously an important part of Thanos’s story. Suggest anyone checking it out reads a handful of modern Guardians stories first though, as I found it hard to keep all the different characters straight on the first read. In fact, I found them so interesting, that I purchased the entire Guardians of the Galaxy run as back issues. Really fun series. I thought Pet Avengers was light weight but not too terrible. It made me smile, especially “Frog Thor.” I have a weakness for anthropomorphised animals, like Rocket Raccoon, and Cosmo. That is the sort of comic I can give to my young nephew or grand daughter. Once they learn to read properly that is. 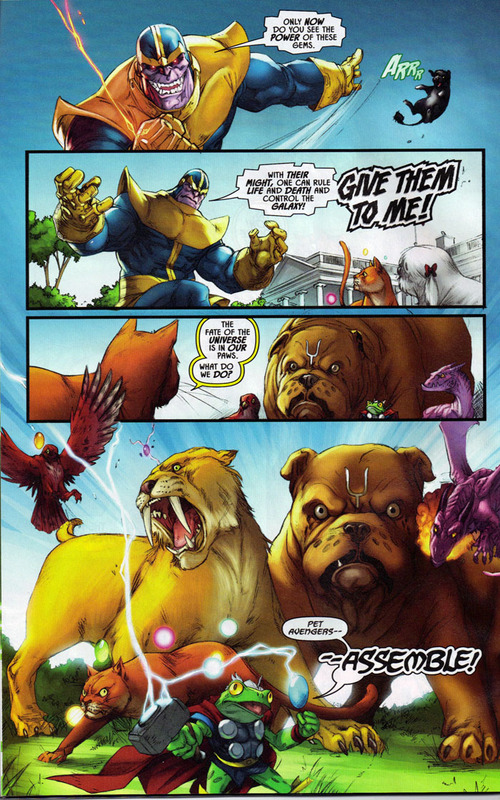 To be fair I’ve never read Pet Avengers and dismissed it out of hand. From a distance it just struck me as flogging the brand, however fun or well-intentioned it may have been. Remember, this is the same company that gave us Spider-Man and Hulk toilet paper. I get angry about stupid things sometimes. I’m kind of attached to the original Guardians of the Galaxy. Tried to read the newer stuff in digital but bounced off the side of it; I’ll go back eventually. I did see a toy set for the new Guardians at Target yesterday, which was curious, as I didn’t think they had that kind of fan base. Did I miss a cartoon? Or was this a stealth IP test — there have been rumors that Guardians is in development for a soonish Marvel movie, which almost makes sense now that we know Thanos is part of the party. 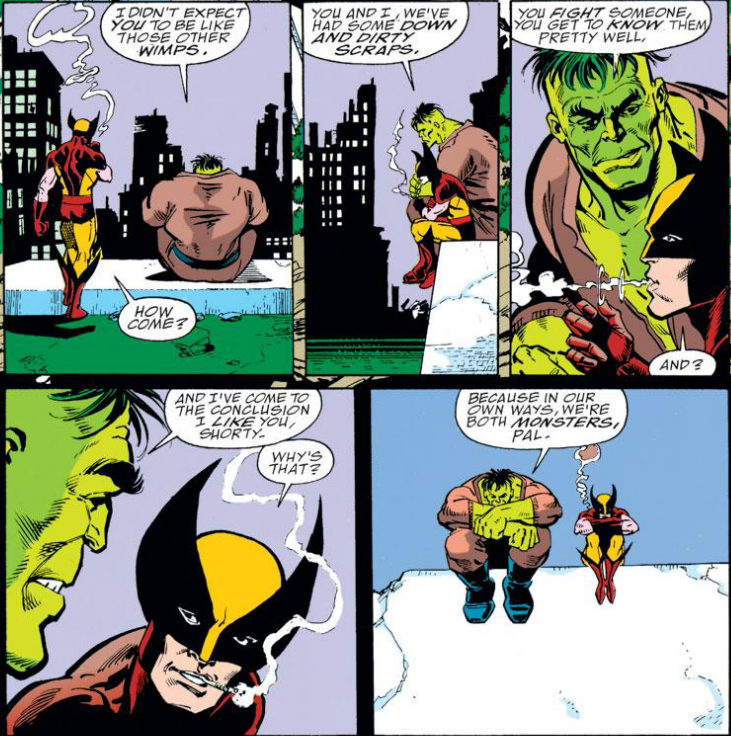 I love that Wolvie / Hulk page – great stuff! Action and plot are all well and good, but in the end, what I think we most cherish in comics is characterization. We’re more likely to remember two characters having a heart-to-heart on a rooftop than we are fifty pages of senses-shattering fist opera. (But at the same time, there’s no real context for one without the other … which is part of the unique charm of comics).